Taste and Coles have had a multimillion-dollar partnership since 2013 which allows readers to shop directly from the site with the supermarket giant. The judges said this partnership is one of the main drivers of Taste’s success at the AMA Awards. “Taste.com.au has such a strong digital strategy and approach and is the only digital platform to have audience targeting capabilities,” the judges said. Taste.com.au dominated at the AMA Awards held this morning in Woolloomooloo, also being named Digital Media Brand of the Year and Food Magazine Brand of the Year. 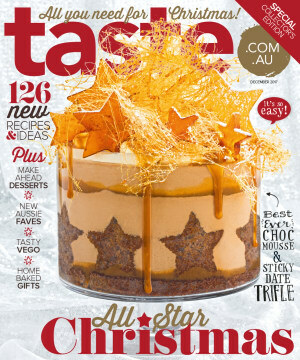 Taste.com.au editor Brodee Myers-Cooke was named Editor of the Year with the brand going from strength to strength under her leadership. “Taste.com.au has impressive revenue and more impressive engagement rates – so Brodee is obviously doing it right,” the judges said. Crikey publisher Eric Beecher has been inducted into the AMA Hall of Fame for his long-standing career in the Australian media. This year we added the new category of Best Launch/Innovation which was handed to Jones Magazine for David Jones, and Best Feature Article, which went to RACV Royal Auto. Overall, NewLifeMedia and rival Bauer each scored five awards at the awards, with Bauer’s Elle title winning the Cover of the Year Award. Taste.com.au has reigned supreme at the Australia Magazine Awards this morning, taking out Magazine Brand of the Year for 2017. This is the second time Taste.com.au has taken out the top gong, also winning the accolade in 2015.